AMH7.0 was printed just as major changes took place in the issuing of the carnet temporary vehicle import document. This post updates and clarifies pp23-4 of the book (right). The AMH7.1 reprint now carries this updated information. There’s a questionable list, but to cut a long story short they include parts of central, east and southern Africa plus Egypt; Iran, Pakistan and India (see map below). A CPD will help get into Australia too, but if you can complete your trip without getting one (by avoiding the above places) so much the better. It is possibly to visit some of these places and not show a CPD, but that requires some luck, persuasion or lodging deposits/paying fees. Recovering a deposit when you leave by some remote border may not be so easy. Carnets can be said to be an aberration, a relic from a bureaucratic heyday designed to stop a vehicle being imported and sold without paying huge import taxes. Most overlanders aren’t intending on selling their vehicles abroad, and most countries in the world are content to stamp your passport with your vehicle details, or issue their an inexpensive temporary vehicle importation permit (TVIP) which adds up to the same thing as a CPD. Little more than a dozen countries demand them (see map above). 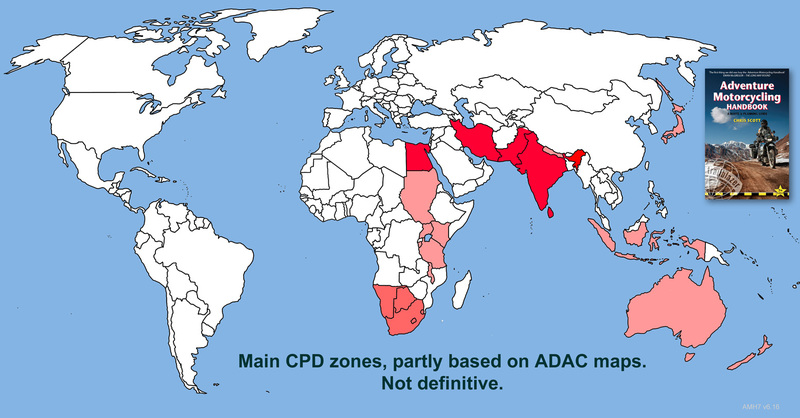 You can go right through the Americas, northwest Africa and across northern or around Southeast Asia without a CPD. A carnet isn’t transferable between other users or vehicles and lasts one year. If necessary it can be renewed or extended on the road. Many a rider on a new expensive bike used to panic on discovering the huge cost of financing a CPD, but in 2016 there was a long overdue shake up which saw what might be called ‘deregulation’ as well as the reduction of some costs, complexities and issuing times. 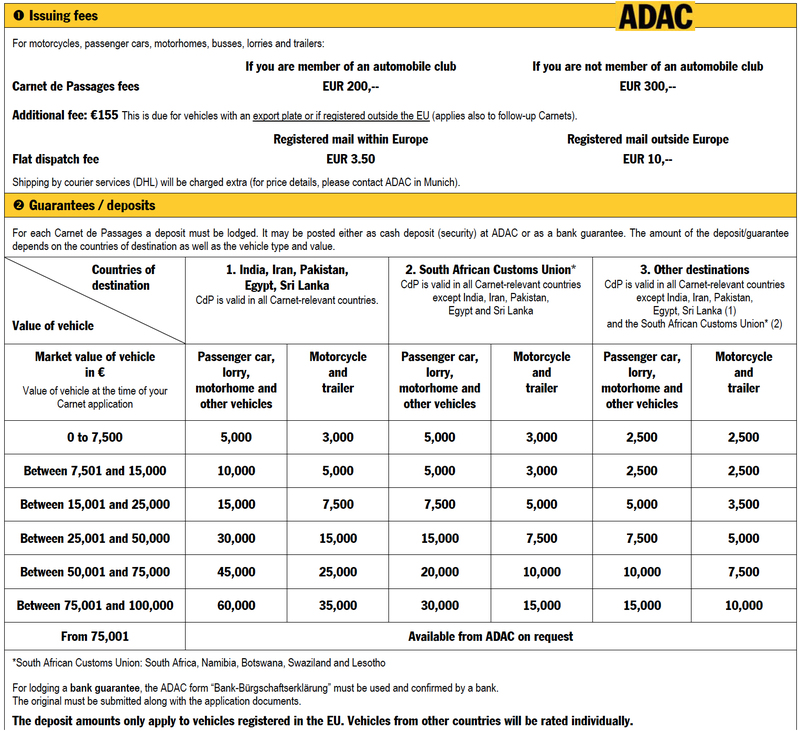 Now, EU nationals apply to Germany’s ADAC, paying a fee of just €2-300 and lodging a deposit. Your CPD is issued in as little as ten days. In the UK CARS have taken over the franchise. See this 2016 post on the HUBB. The German ADAC, who was doing Brit CdPs for a few months, now forwards your apps to CARS. For Canadian and American nationals the service has been handed over to Boomerang Carnets in Illinois who do the job from $775. Both the ADAC and Boomerang can provide a quote, even if you don’t come from the listed countries. (This is what many Brits were doing in the dying days of the RAC-era: apply with the ADAC with much less hassle and cost.) Fees may be greater than those shown, but less than your local CPD issuing authority. A September 2016 quote from Boomerang for East Africa on a 2015 F800GSA (US reg) worth $9000: $1350 fee, plus $9000 deposit. Or $2350 fee with no deposit. That’s a fee up to five times more than the ADAC would ask and with a 50%+ higher deposit. In South Africa it’s still the AA of SA, and in Australia it’s the AAA in Canberra where, in early 2017 it was said they’ve withdrawn the option of lodging a bank guarantee. According to the pdf application form from the link above, the cost adds up to AUD1420 of which AUD500 is refundable. Carnets essentially guarantee covering the cost of the highest level of duty on your vehicle in the countries concerned, should it not be re-exported. Egypt, Iran, Pakistan and India (plus Sri Lanka – dark red on the map, above) have long been in the most costly zone where duties are up to 800% of vehicle value – let’s call it ‘EIPI’. 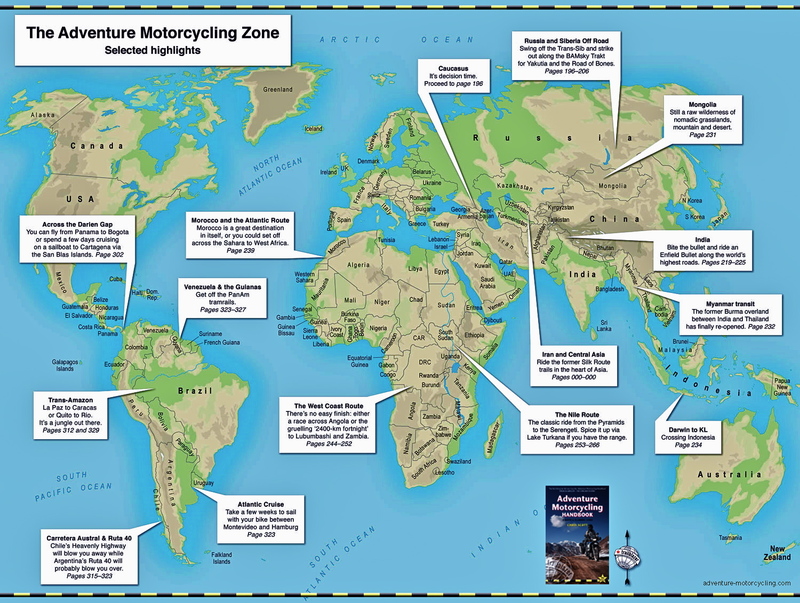 But where once having those countries listed on your CPD required depositing up to a staggering eight times the value of your bike, the ADAC currently asks no more than 100% and as little as 30% for non-EIPI places. So for example, using the table left a £10,000 bike falls in the ADAC’s €7501-15,000 euro bracket which requires a fixed deposit of €5000 if visiting anywhere in the EIPI. That drops to €3000 if dodging the EIPI but passing through the South African Customs Union (SACU: SA, Swaziland, Lesotho, Namibia and Botswana), and only €2500 for anywhere else that requires a CPD, but not including the ‘EIPI’ or SACU. Of course the valuation of your bike is open to interpretation – you’ll want it as low as possible, but as you can see anything worth under €7500 incurs the same deposit, be is a 2013 XT660Z or a Jawa 250 Road Toad from the late 1970s. With the latest changes you now simply pay the deposit into the ADAC bank which is returned in full when your carnet is discharged at the end of your travels.